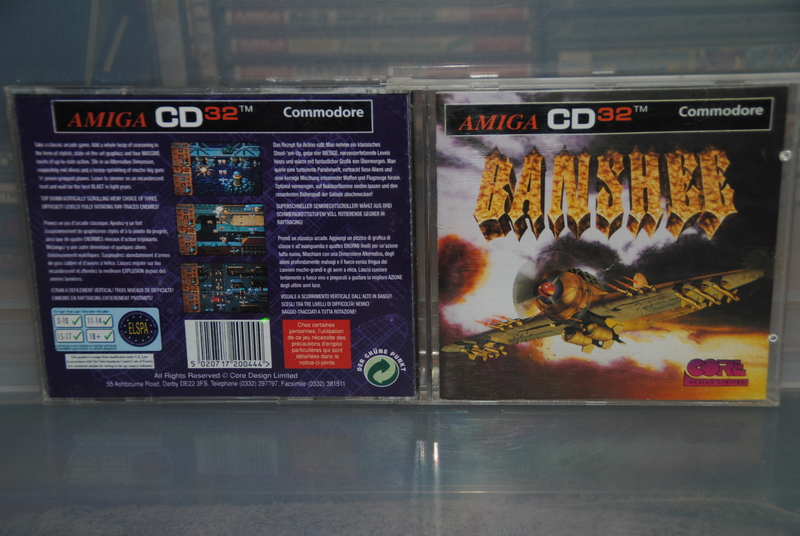 The Amiga certainly had its fair share of brilliant shooters over the years,most people mention games like Apidya, Hybris, Blood Money, Project X or Battle Squadron as their number one Amiga shoot ’em up, all splendid titles but very few people mention any of the brilliant AGA exclusive shooters like Banshee, Super Stardust, T-Zer0 and so on. 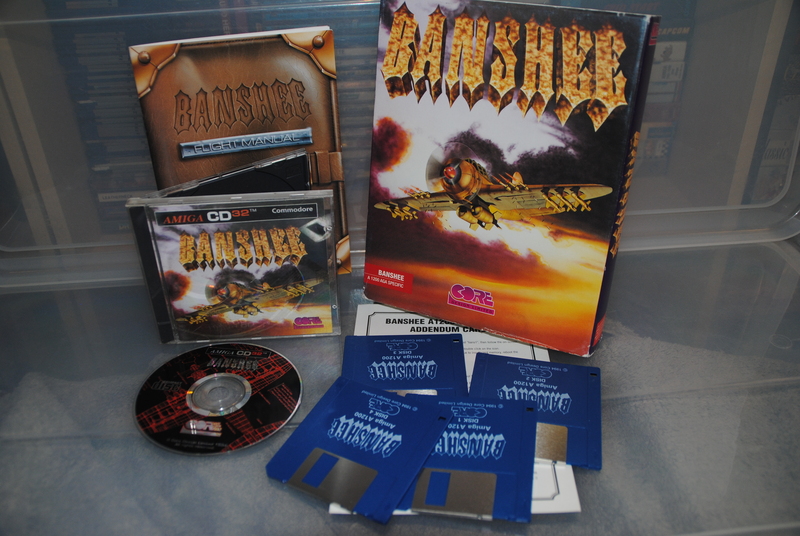 Core Design made a few shoot em ups for the Amiga but none of them ever reached the true brilliance of Banshee, everything from the box design and down to the very last in-game pixel oozes quality and style, they thought about everything and really wanted to make the best shooter ever to grace the Amiga. The question is if they really put out the best game of this genre or not i guess, it’s been an amazing 24 years now since the release of the game, and to make it even more apparent the Amiga is on its 33rd year now. The front of the Banshee box is indeed amazing but the back is definitely not any worse, brilliant use of colours and the screenshots shouts *BUY ME* even by today’s standards. That 2 player option sticker certainly tickled a lot of people’s attention too. 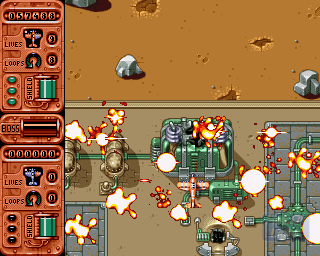 There is a flashy intro with one of the strangest stories ever in a Vertical shoot ’em up for sure, some twiddle twaddle about microwave ovens and stuff like that. Not worth much attention really, well except for the art direction which is really special and one of the very few steampunk games in the genre. It’s obvious from the very first second of the game that these guys have done everything they could to make a very good looking game. Some shots from the first part of the game, the intro sequence is just a slideshow with text (left screenshot), the middle picture is a very lush one that most likely has taken them weeks to render back in the day. 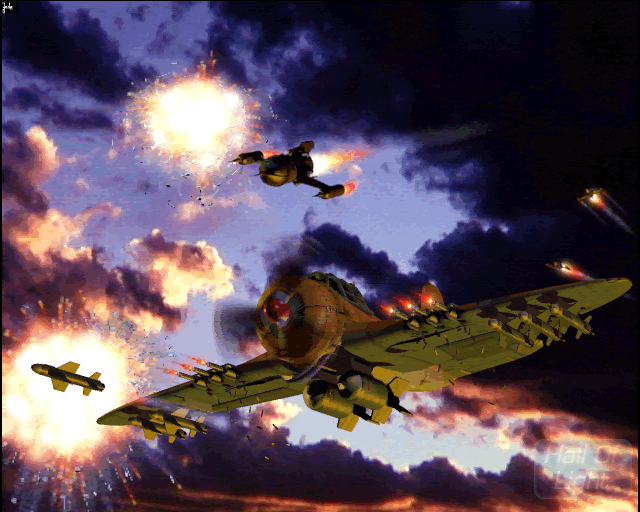 The picture to the right is from the first level in the game, it screams 1942 in both look and playstyle, but guess what? It is done so nicely that even if it copies a classic it still manages to outdo it in just about every move it does. 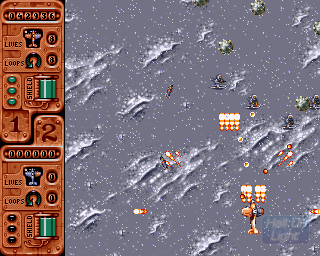 Banshee comes with a Loop’d Loop moves like the one in 1942 which was a very uncommon thing in games at the time as most vertical shooters had smart bombs and such. 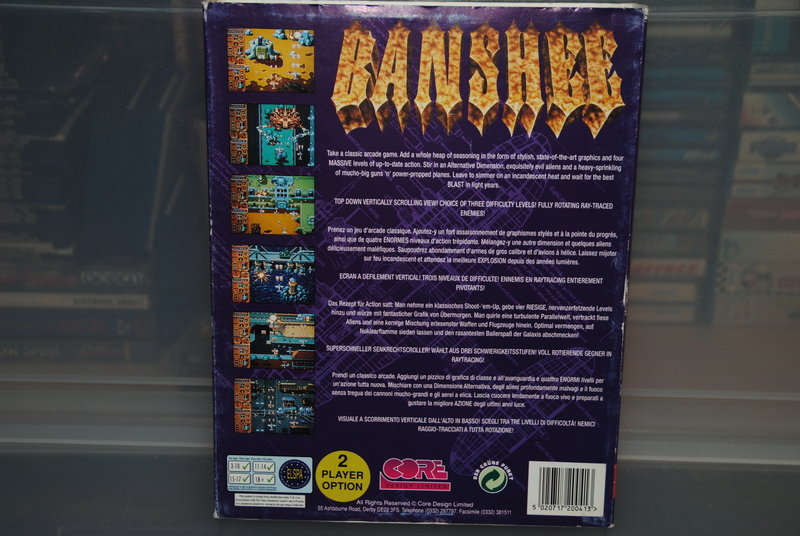 Banshee is one of those games that have only a few levels, four of them to be precise but the levels are extremely long and can take up to 20 minutes just to reach the various boss fights. You get various upgrades options and at one point you might get a bit overpowered if you manage to stay alive that is. Most of the time you want to pick up extra lives and health as the game can be pretty difficult at times. Dodging bullets is never boring in Banshee as the levels are always changing and the graphics style more or less begs you to continue to play the game. Banshee is one of the few shooters that I know of that changes weather effects on the fly, blizzards, wind, rain, fog etc yes you name it and it’s there I guess. Everything changes so much that once the effects stop and the game returns to the normal look everything looks like a million dollars really. Another very cool thing with Banshee is the small details everywhere, shoot a guy and he swims in blood, shoot a crane and the “load” falls down, shoot a truck and lots of people jump out of it screaming, while in flames, naturally. There are so many quirky details everywhere that it’s actually adding replay value just because of those alone, you end up thinking “hmm, i wonder what happens if i shoot that?” quite a lot really. There’s one thing about Banshee that is still a bit of a mystery to me, there ain’t any in-game music while playing and all you get is sound fx and bullet samples etc, you will get fed up with the sound eventually but thanks to the diversity of the levels and weapons it will take much longer than normally. 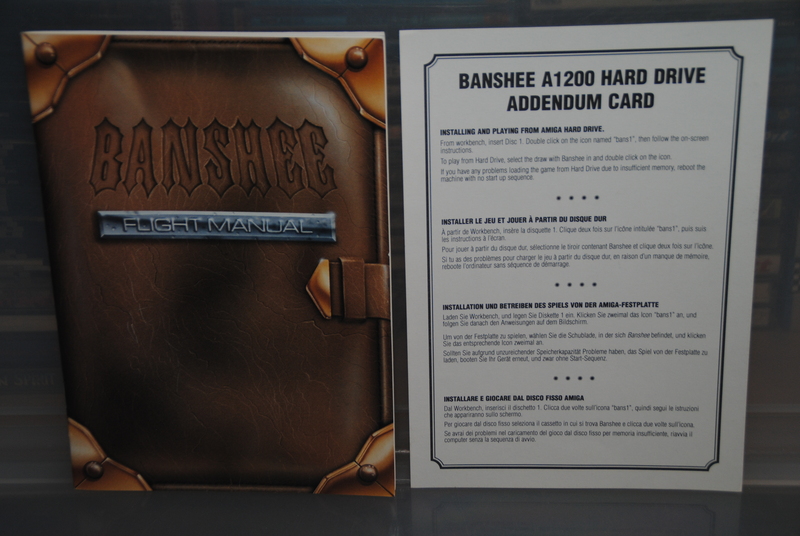 The game comes with both a manual and an extra flyer info card which explains how to install the game onto the Harddrive. 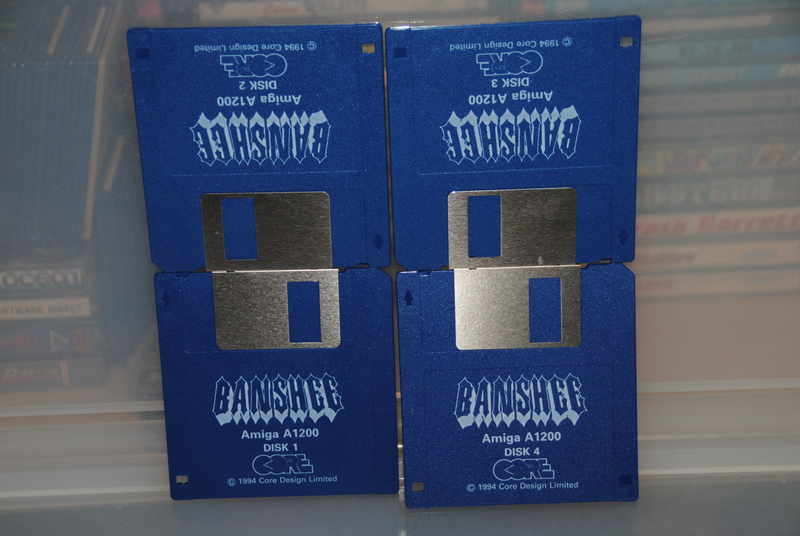 Banshee came on four disks which were the standard for many games back in 1993-95 really, I never used the floppies much myself as I installed the game on hard drive right away and never looked back. 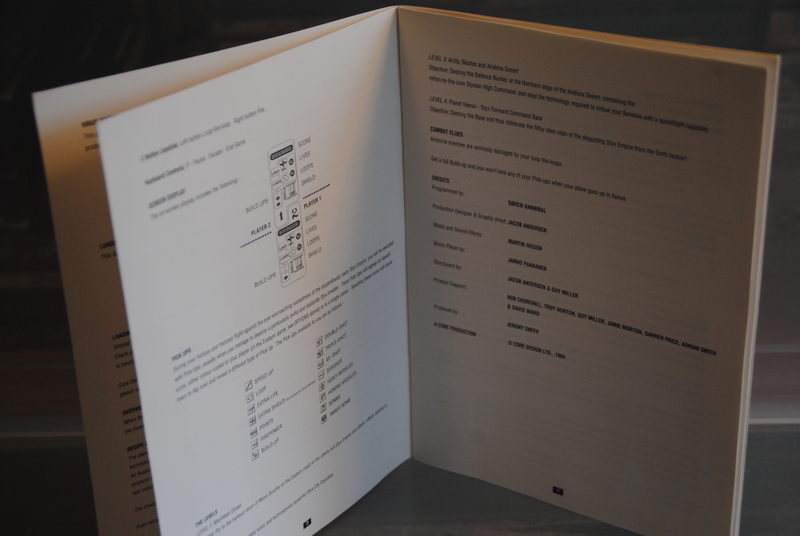 Oh and look at that awesome design on the front of the manual. 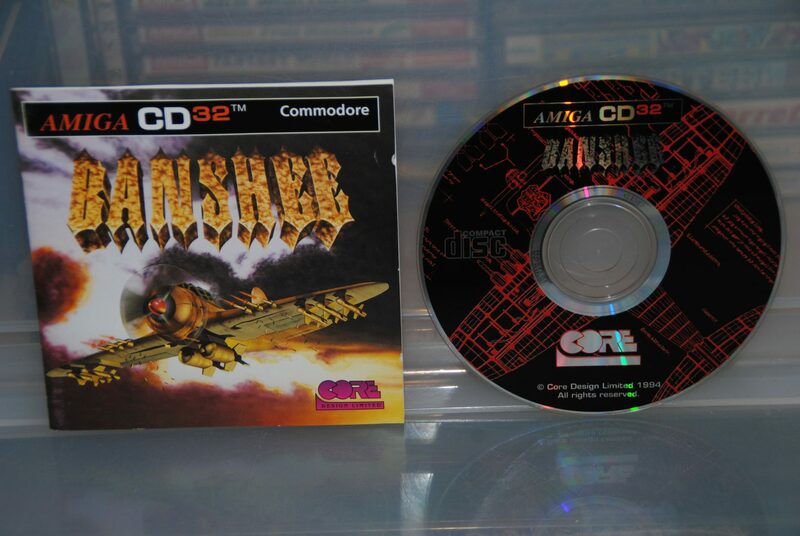 Banshee CD32 was somewhat of a let down really, the game didn’t add any in-game CDDA music or an FMV intro, the game was identical to the floppy version and while it’s a near perfect game its still a lost opportunity and could have been a proper game changer for the CD32. The box design is very similar to the big box and i am 100% certain that most if not everyone who bought it back in the day loved it to bits even if it didn’t use the CD32 hardware/*media for what it was worth. Brilliant looking CD and manual/insert. The game is fully enjoyable even with the horrible CD32 controller, yes a joystick is of course much better than any dedicated CD32 pad would ever be but still worth it. Who would have thought? , the controls are super tight even with a joypad. 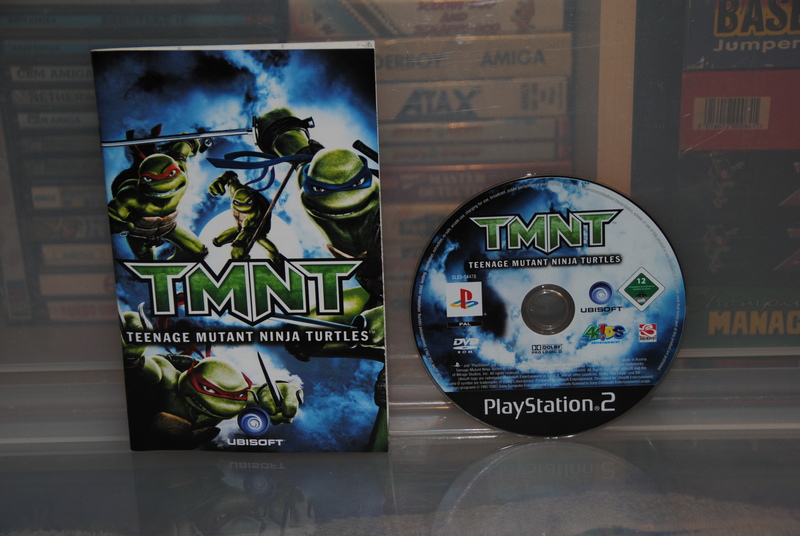 No CD32 gamer out there should be without this gem, its one of the best games to ever grace the system. I decided to include this long play video here so that you guys can see how bloody brilliant this game really is. The video has no ties to this blog what so ever and I randomly picked it from Youtube. Here you can see both versions available for the game, the CD version was a let down indeed as they had a golden opportunity to add music via the CDDA but then again, maybe they tried and found out that the game simply didn’t work out with music at all. 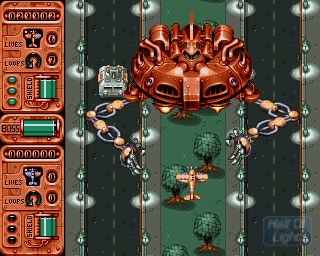 Core Design did a fantastic job with this game and I must add that this game is most definitely in my top 10 of all time Amiga list, closer to perfection than this is hard to get, it’s damn near perfect and just about every second of the game feels like pure magic. 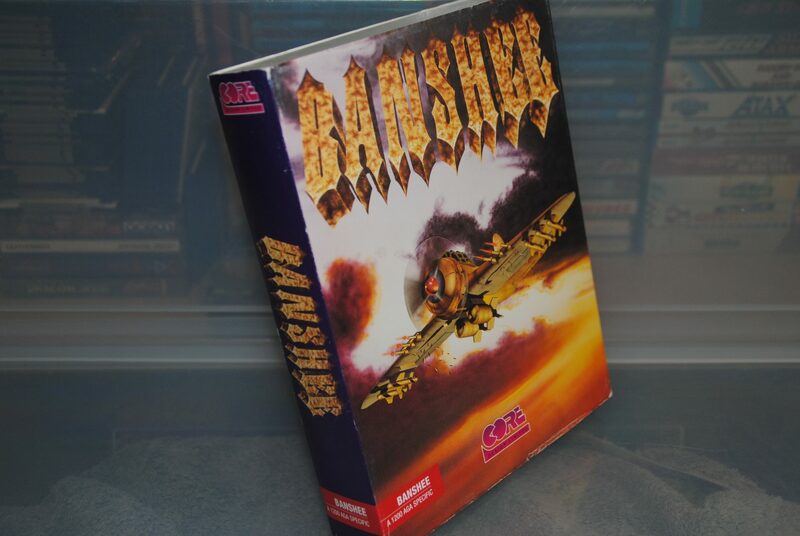 Banshee stood the test of time better than most games of the era and to me, this is up there with the first Raiden games and even the very recent Sky Force Reloaded (which is clearly inspired by Banshee in the first place). 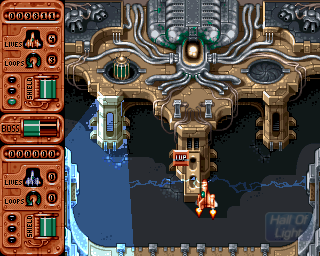 The box shots are from my own game collection as always, but the screenshots come from the best Amiga gaming resource out there – Hall Of Light -. VERY nice article!! Love this games so much and I was so proud when I completed it without a trainer back in the day! 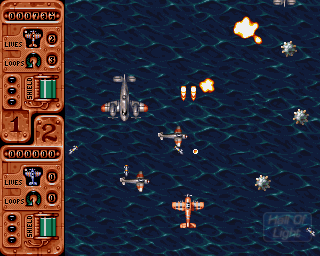 This is on my top 5 Amiga games of all time!! Great stuff. 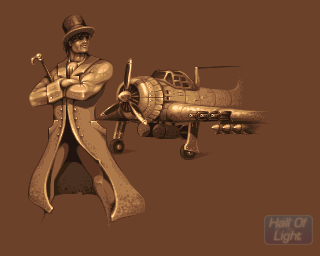 Furthermore, steampunk is another of those set-ups that you don’t see very often.